"Szany is a "large community" ("large village constituting an administrative division in Hungary" - from the vocabulary) in Gyor-Moson-Sopron county in the Little Hungarian Plain. "First it was mentioned in a document as "Zayan" in 1398. It was registered as a borough. The St Vendel Chapel was built in 1747 then in 1753 the St. Anne Chapel that became a significant place of pilgrimagr. The nave of the three-towered church (which was enlarged in 1867) built in 1767 and the Bishop' Castle" (Bishop of Gyor) "in 1783 are the most charasteristic buildings of the community. Szany is 18 km to Csorna and 20 km to Pa'pa on the road and railway between Pa'pa and Csorna. 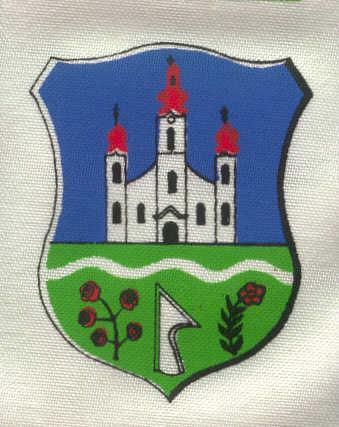 The village has got 2.369 inhabitants (only Hungarians; 1990 census). 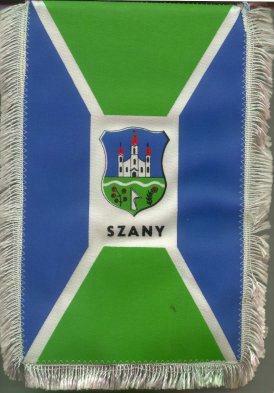 Szany was and is in the Gyor (1925-1950 Gyor-Moson United, 1950-1990 Gyor-Sopron, from 1990 Gyor-Moson-Sopron) County. Szany in 1427 is borough. In 1594 was 120 family in the village, but the Turkish army destroyed it. In 1619 was 16 family in there. In the end of the 19th century, Szany became community and in 1977 became "large community". I got the flag from Mr. and Mrs. Szabo'. Mrs. Szabo (Zsuzsa Orba'n) was born in the village, but she couldn't give me more information about the CoA. In the village is the church with three tower, I think this chuirch is on the CoA. The white wawy lane symbolises the Ra'ba River - I think.